A few passing clouds. Low around 75F. Winds SSE at 10 to 20 mph..
Mark Gentile asks Sarasota County Sheriff Deputy Cathy Duff a question about safety issues during an active shooter educational talk. 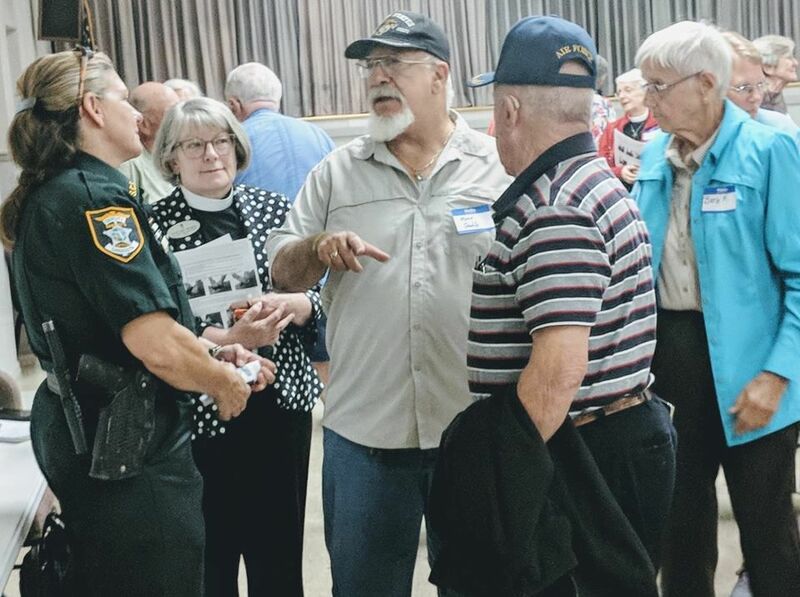 Sarasota County Sheriff Deputy Cathy Duff listens to residents after she spoke at a recent Just Neighbors meeting in Englewood. ENGLEWOOD — Stabbing a person, creating a distraction or even throwing a basketball at someone with a gun are some survival tactics that could save lives. “We live in some scary times,” said Deputy Cathy Duff. 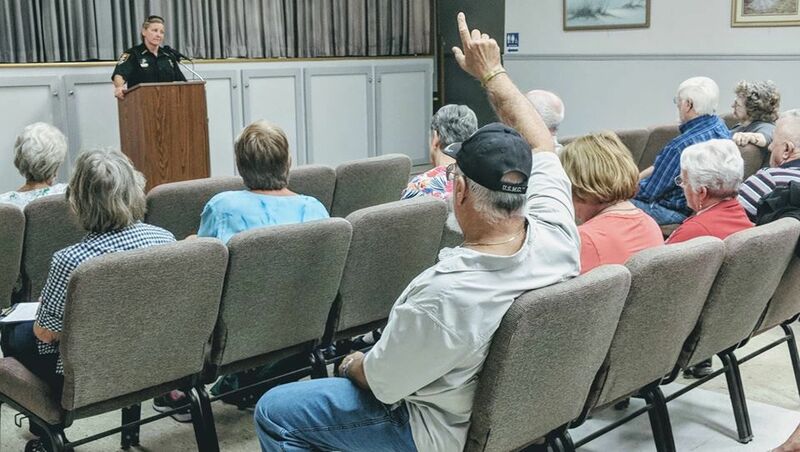 The Sarasota County Sheriff’s deputy spoke to a group of 60 at the Just Neighbors meeting at St. David’s Jubilee Center in Englewood last week. The group meets monthly at the church to hear a speaker and discuss community issues. Their most recent meeting addressed mass shootings, and the life-or-death decisions people can make in those situations. Duff gave several scenarios people could encounter at a grocery store, a school, office or other public place. She said people can better protect themselves if they are aware of their surroundings, even if it’s at a church or restaurant. “A lot of people think ‘it’s never going to happen to me,’” she said. “Those who are less-prepared for a situation, the worse it is for survival. Duff said because police officers are trained and routinely practice active-shooter drills, they use the techniques in everyday life. Duff said using situational awareness outside of the home is imperative. She said knowing the exits at a theater, church, hospital, library, store, concert will help with an exit plan. Duff said once inside a room, anticipate what to do if you know a shooter is checking door handles. Duff mentioned a 29-year-old Indiana science teacher who threw a basketball at a student armed with two handguns. As the shooting began, the teacher hit him with the basketball. As bullets fired, the teacher tackled the student. Other students screamed and took cover. One girl was shot, but not killed. “The teacher was shot as he swatted the gun away, but he lived and he saved his students’ lives,” she said. The May shooting came a week after eight students and two teachers were gunned down in a school in Santa Fe, Texas. Duff said students, teachers and anyone else can text to local police departments using 911. The practice was used after texts were unsuccessfully sent during a campus shooting in 2007. Police didn’t receive the messages. Duff said when calling or texting 911, it’s important to give as many details as possible, especially a description of clothing. Duff said with the strange events in today’s world, residents shouldn’t be afraid to report suspicious behavior or activities. The site includes statistics and signs to watch for, videos and a 47-page survey about active shooters and their behaviors. "The survey said 86 percent of active shooters had significant social interactions with at least one person in the year prior to the attack," said Deputy Kathy Duff. "About 73 percent had a known connection with the attack site. We tell people to be mindful of how a person is terminated (fired from work) and the reaction or kind of behaviors that follow." Sarasota County Sheriff's Deputy Cathy Duff will go to businesses, church or school groups and and speak about active shooter situations and perform safety visits. For more information, call 941-861-4927.